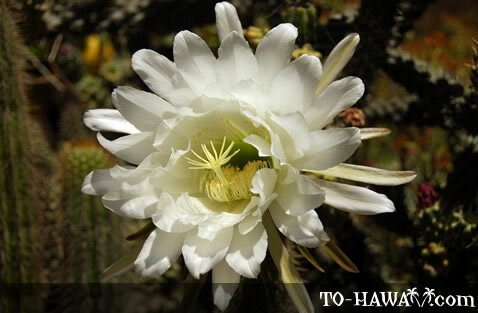 The first night-blooming cereus arrived in Hawaii in 1830 aboard the sailing ship Ivanhoe. The plant has a fleshy stem with aerial roots, which makes it capable of climbing up trees and walls. It blooms in the summer and fall. Its yellow-white flowers can be a foot (30 cm) long and emit a spicy fragrance. They open in the early evenings and wither the next day.